Add a pretty pop of colour to your look with this stunning pendant. 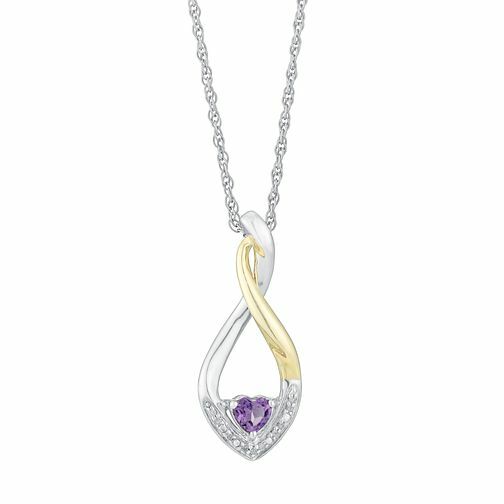 Crafted in argentium silver for a gleaming finish, this beautiful pendant is set in an elegant pear drop shape complete with twist detailing, with a heart shaped vibrant amethyst at its centre and is finished with dazzling diamond detailing for a splash of sparkle. Silver & Yellow gold Diamond & Amethyst Heart Drop Pendant is rated 5.0 out of 5 by 1. Rated 5 out of 5 by Anonymous from Simply Beautiful! Bought this as a Christmas present for my mum along with the matching amethyst heart earrings. She loves them! Though the earrings are bit on the small side, not what I was expecting from picture. Necklace is simple but beautiful! Would definitely recommend! Thinking of purchasing a ring to match!